Objectives: Intrauterine adhesion is a disease involving endometrial fibrosis that arises from injury to the basal layer of the endometrium. Here, we aimed to explore the preventive effects of decellularized and lyophilized amniotic membrane on endometrial fibrosis in a rat model of intrauterine adhesion. Materials and Methods: Twenty-four Sprague-Dawley rats were randomly divided into 2 groups. For the intrauterine adhesion group, endometria of left uteri were scraped without treatment. For the intrauterine adhesion plus decellularized and lyophilized amniotic membrane transplant group, decellularized and lyophilized amniotic membrane was sutured onto the scraped wound of left uteri. Right uteri were kept as the control group. At 3, 7, 14, and 28 days after transplant, uteri were sampled for histologic and immunohistochemical evaluation. Results: Histology examination revealed extensive fibrosis with significantly reduced numbers of endometrial glands in uteri in the intrauterine adhesion group. Immunohistochemical staining showed a remarked increase in expression of transforming growth factor β1 (P < .01) and decreased expression of matrix metalloproteinase-9 (P < .01) in the intrauterine adhesion group. In rats with transplant of decellularized and lyophilized amniotic membrane, endometrial fibrosis apparently improved (P < .05) with reduced expression of transforming growth factor β1 and increased matrix metalloproteinase-9 expression (P < .05). However, there were no significant differences in the number of endometrial glands or endometrial thickness between the 2 groups (P > .05). Conclusions: Development of intrauterine adhesion was prevented with transplant of decellularized and lyophilized amniotic membrane via suppression of transforming growth factor β1 and increased production of matrix metalloproteinase-9 in a rat model. Intrauterine adhesion (IUA), also referred to as Asherman syndrome, is a consequence of endo­metrial fibrosis that arises from injury to the basal layer of the endometrium. The increased occurrence of IUA has been reported to be the result of increased induced abortions and hysteroscopic operations performed in clinic. Once IUA develops, patients have severe complications, including abnormal menstruation (amenorrhea or hypomenorrhea), secondary infertility, and recurrent abortion.1,2 The prevalence of Asherman syndrome in women with hysteroscopic operations and abortion ranges from 3.7% to 45.5%.1 Approaches such as hysteroscopic adhesiolysis, intrauterine balloon, intrauterine contraceptive device, hyaluronic acid gel injection, and oral estrogen treatment have been used in an attempt to relieve IUA.1-3 Although some achieve­ments have been reported, there is still no effective therapy in preventing development of IUA resulting from endometrial fibrosis, and the prognosis is usually poor. However, fresh AM has potential risks regarding transmission of pathogens when transplanted between different individuals and cannot be stored over a long time. 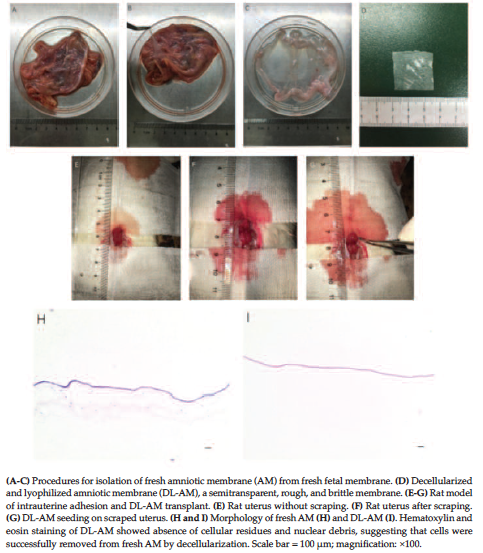 Decellularized and lyophilized amniotic membrane (DL-AM) can preserve pro­perties of AM at high biocompatibility and less immunogenicity and can overcome the disad­vantages of fresh AM samples in storage with regard to pathogen transmission.14 Decellularized and lyophilized amniotic membrane has also been reported to attenuate postinfarct left ventricular fibrosis.15 However, whether DL-AM has the potential to reduce IUA by ameliorating endometrial fibrosis is still unknown. In the present study, a DL-AM was developed to transplant to treat scraping wounds in rat uterus. The preventive effects in reducing endometrial fibrosis by DL-AM were investigated. With proper informed consent and approval from the ethics committee of Beijing Shijitan Hospital affiliated with Capital Medical University (Beijing, China), AM was obtained under sterile conditions after cesarean delivery from women who had seronegative results for syphilis, human immuno­deficiency virus, and hepatitis B and hepatitis C virus. The AM was separated from the chorion tissue by blunt dissection. After a thorough wash with 0.9% sodium chloride solution 3 times to eliminate residual blood, AM was incubated with 0.02% ethylenediaminetetraacetic acid solution for 2 hours at 37℃ with continuous stirring for decellularization. After a repeated washing with distilled water, decellularized AM samples were then dried in a lyophilizer and underwent gamma-ray (Co-60) irradiation for sterilization and vacuum packed for further experiments (Figure 1A to 1D). For this study, we used 8-week-old female Sprague-Dawley rats (Beijing Vital River Laboratory Animal Technology, Beijing, China). Rats were housed under a 12:12-h light-dark cycle with free access to water and food. Experimental procedures were performed in accordance with the Institutional Animal Care and Use of Laboratory Animal guidelines and were approved by the Laboratory Animal Ethics Committee of Beijing Shijitan Hospital. Twenty-four Sprague-Dawley rats were ran­domly divided into 2 groups: the IUA group and the IUA + DL-AM group (12 rats/group). Desquamated vaginal cells were examined before treatment and tissue collection to determine estrous cycle. All rats were treated and killed at anestrus period. After intraperitoneal injection of 10% chloral hydrate, a vertical incision was made in the abdominal, and the “Y”-type uterus was exposed. Each left uterus was opened, and the inner surface of uteri was scraped with a No. 21 razor blade. The right uterus of each animal was kept as the control group. Wounds were carefully sutured with 10-0 nylon sutures. In the IUA + DL-AM group, a DL-AM was sutured to the stroma wounds at the inner surface of the uterus caused by scraping and sutured to stromal layer (Figure 1G to 1H). At 3, 7, 14, and 28 days after operation (3 specimens/time point), specimens were harvested for histologic evaluation (see below and Figure 2). Specimens were fixed in 4% paraformaldehyde and cut into 5-μm-thick sections. Masson staining was performed to evaluate fibrosis formation. The ratio of endometrial fibrosis area to whole endometrial area in each high-power field (HPF; ×100) (determined as the mean of 4 HPFs in each uterus section, with 2 sections selected for each rat for analysis; 24 HPFs in total) was calculated by Image-Pro Plus version 6.0 (Media Cybernetics, Silver Spring, MD, USA). The number of endometrial glands was counted in HPFs under a light microscope (BX51, Olympus, Center Valley, PA, USA). For each uterus section, 4 fields were selected for counting (24 HPFs in total). The thickness of the endometrium was also calculated for each uterus specimen (6 sections in each rat; 18 sections in total in each group). For immunohistochemistry, sections were depa­raffinized, rehydrated, and incubated in 0.3% Triton X-100 for 30 minutes. Antigen retrieval was performed with 0.1 mM sodium citrate at approximately 95°C to 100°C for 15 minutes, followed by immersion in 3% hydrogen peroxide solution to block endogenous peroxidase activity. The primary antibodies (diluted by 1:100) used were monoclonal anti-TGF-β1 (ab27969, Abcam, Cambridge, MA, USA) and anti-MMP-9 (ab58803, Abcam), which were incubated with tissues overnight at 4°C. After they were washed with phosphate-buffered saline, sections were incubated with secondary antibody at room temperature for 30 minutes. Sections were then stained with 3,3’-diaminobenzidine solution. For immunohistochemical analyses, integrated optical density values were introduced to evaluate the expression of TGF-β1 and MMP-9. Data were presented as means and standard deviation and were analyzed using SPSS software (SPSS: An IBM Company, version 22.0, IBM Corporation, Armonk, NY, USA). We used t test for statistical analysis. Image-Pro Plus software was applied to evaluate the degree of fibrosis and to compare the expression of TGF-β1 and MMP-9 among the different groups by integrated optical density values. P < .05 was considered statistically significant. As shown in Figure 1, nuclei in the epithelium of fresh AM were clearly stained under phase-contrast microscopy, with no visible cells in the surface of DL-AM. Masson staining of the control uterus confirmed the presence of columnar endometrial epithelial cells and endometrial glands (both stained red) in the endo­metrial stromal layer. At 3, 7, 14, and 28 days after scraping, uteri were devoid of columnar epithelial cells and most endometrial glands (Figure 3). The ratio of fibrotic area to whole endometrium area was calculated on day 3, day 7, day 14, and day 28 after scraping. We observed that the degree of fibrosis on days 3, 7, 14, and 28 was significantly more severe than shown in the control group (n = 24; P < .05). After transplant of DL-AM for 3, 7, 14, and 28 days, the ratios of endometrial stromal fibrosis relative to the whole endometrium were smaller than results shown in the IUA group (P < .05), although still higher than in the control group (P < .05) (Figure 3B). The number of endometrial glands and endometrial thickness results were quantified and measured in the study groups. The number of endometrial glands and the endometrial thickness results in the IUA and IUA+DL-AM groups were significantly decreased compared with control uteri (P < .05). No statistical significance was detected in the number of endometrial glands and endometrial thickness in each group at 3, 7, 14, and 28 days after surgical scraping and after seeding with DL-AM (P > .05) (Figure 3). Transforming growth factor β1 was weakly expressed in the stromal layer of the control uterus. After scraping was conducted, the level of TGF-β1 expression was significantly higher than shown in control uteri (P < .01). In the IUA + DL-AM group, the expression of TGF-β1 in uteri after seeding with DL-AM at 3, 7, 14, and 28 days was decreased compared with scraped uteri without DL-AM but still higher than shown in control uteri (Figure 4). Matrix metalloproteinase-9 (MMP-9) was highly expressed in the stromal layer of the control uterus. However, after scraping was conducted, we observed less positive staining against MMP-9 in scraped uteri (P < .01). In the presence of DL-AM, the expression of MMP-9 was increased compared with scraped uteri, although lower than shown in control uteri (P < .05) (Figure 5). The prevalence of IUA is rising in line with the increasing numbers of induced abortions and hysteroscopic surgeries in clinic. The most common cause of IUA is reported to be trauma to a gravid uterine cavity, especially during dilation and curettage.3 It is therefore necessary to explore novel options for treatment of IUA, to repair the damaged endometrium, and to restore the uterine physiologic function in such patients. In our present study, a rat model of IUA was established via endometrial scraping to recapitulate pathogenesis and pathologic changes of IUA. 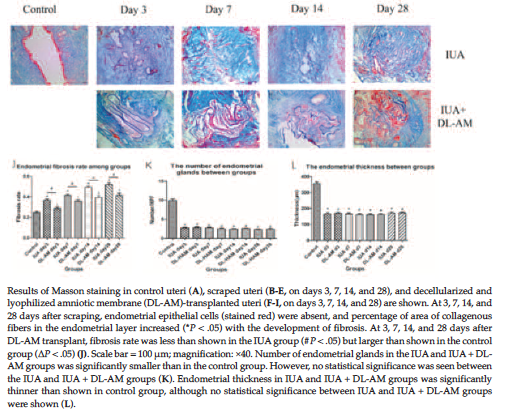 Histologic analyses demonstrated that progression of IUA in this model was associated with loss of endometrial epithelial cells and endometrial glands, leading to disappearance of the uterine cavity. When the ratio of the area of endometrial fibrosis relative to the whole endometrial area is calculated, the degree of endometrial fibrosis can be determined.16-18 Results of Masson staining showed that at 3, 7, 14, and 28 days after scraping, endo­metrial stromal fibrosis progressed gradually into adhesion of uterine wall. The AM has been widely and long used in wound repair. It has been reported that AM can improve menstrual cycling, reducing the recurrence of adhesions and encouraging endometrial regeneration.19-21 However, the sample sizes involved in these studies were insufficient, and the mechanisms of AM regarding prevention of IUA have not been fully elucidated. Moreover, whether amniotic epithelial cells are involved in inhibition of IUA remains unknown. Decellularization of AM eliminates the immu­nogenicity of AM and exposes its ECM proteins, thus promoting better cell proliferation and differentiation compared with intact AM.14,22 However, studies on AM also revealed that the expression levels of various growth factors, such as epidermal growth factor, transforming growth factors (TGF-α, TGF-β), and keratinocyte growth factor, which also participate in wound healing, were higher than those shown in denuded AM.7 Decellularized AM has been used for treatment of burn injuries and showed effectiveness in healing burn wounds.23 De-epithelized AM has been used for healing of postlaryngectomy pharyngocutaneous fistulas24 and pericardium wounds25 and has been shown to promote left ventricular remodeling.15 However, whether decellularized AM has a preventive effect on IUA remains unknown, as is how decellularized AM acts on IUA. Consequently, our research aimed to apply DL-AM, in a manner that could provide known advantages of AM and to overcome known disadvantages, to transplant scraped uteri to investigate the preventive effects of DL-AM on IUA. In this manner, we were also able to evaluate the expression of TGF-β1 and MMP-9 and thus to ascertain whether DL-AM could inhibit the formation of fibrosis. Masson staining and counting of endometrial glands showed that the degree of endometrial fibrosis was more severe in scraped uteri than in the control group. After DL-AM transplant, the degree of fibrosis improved but did not fully recover, suggesting that DL-AM may only partially inhibit the severity of fibrosis. This result was in agreement with clinical studies and provided further evidence of the effectiveness of DL-AM in the prevention of IUA. However, there was no statistical difference between scraped uteri and DL-AM-transplanted uteri in terms of the number of endometrial glands. Furthermore, we did not observe any evidence of endometrial epithelium regeneration, suggesting that the effects of DL-AM were limited and that other methods will also be needed to help regenerate endometrial epithelium. Transforming growth factor β1 plays a critical role in wound healing and fibrogenesis and has long been considered to be a central mediator of fibrosis, including in IUA.4 The plasma concentration and tissue expression of TGF-β1 have been shown to be significantly higher in IUA patients.26,27 The enzyme MMP-9 represents the most widely documented protease in the inflammatory process and in tissue remodeling.28 It is known to degrade ECM com­ponents, including laminin, entactin, and fibronectin.29 In the process of fibrosis, high levels of TGF-β1 suppress the expression of several MMPs by binding to the promoter region of MMP genes, thus inhibiting degeneration of the ECM and contributing to the accumulation of ECM.30,31 In addition, MMP-9 has been proven to be involved in fibrosis of lung28 and skeletal muscle29 but not uterine fibrosis. In our research, we found that the expression of TGF-β1 in scraped uteri was higher than observed in the control group, which was in accordance with the physiology of IUA and previous studies.26,27 When DL-AM was transplanted, we observed lower expression levels of TGF-β1 compared with scraped uteri at the same time points. In scraped uteri, expression of MMP-9 was significantly reduced compared with control uteri. Transplant of DL-AM inhibited this reduction in MMP-9 expression, suggesting that DL-AM could inhibit TGF-β1 expression but activate MMP-9 expression, thus suppressing the formation of fibrosis. In conclusion, we found that, with development of IUA, the expression of TGF-β1 was significantly increased, whereas the expression of MMP-9 was greatly reduced. Transplant of DL-AM ameliorated the degree of fibrosis with suppressed expression of TGF-β1 and improved production of MMP-9. By maintaining this balance between TGF-β1 and MMP-9 deposition, DL-AM prevented formation of fibrosis in injured endometrium. March CM. Management of Asherman's syndrome. Reprod Biomed Online. 2011;23(1):63-76. Yu D, Wong YM, Cheong Y, Xia E, Li TC. Asherman syndrome--one century later. Fertil Steril. 2008;89(4):759-779. Lin X, Wei M, Li TC, et al. A comparison of intrauterine balloon, intrauterine contraceptive device and hyaluronic acid gel in the prevention of adhesion reformation following hysteroscopic surgery for Asherman syndrome: a cohort study. Eur J Obstet Gynecol Reprod Biol. 2013;170(2):512-516. Gabbiani G. The myofibroblast in wound healing and fibrocontractive diseases. J Pathol. 2003;200(4):500-503. Jurado Acosta A, Rysa J, Szabo Z, et al. Transcription factor PEX1 modulates extracellular matrix turnover through regulation of MMP-9 expression. Cell Tissue Res. 2017;367(2):369-385. Fairbairn NG, Randolph MA, Redmond RW. The clinical applications of human amnion in plastic surgery. J Plast Reconstr Aesthet Surg. 2014;67(5):662-675. Koizumi NJ, Inatomi TJ, Sotozono CJ, Fullwood NJ, Quantock AJ, Kinoshita S. Growth factor mRNA and protein in preserved human amniotic membrane. Curr Eye Res. 2000;20(3):173-177. Toda A, Okabe M, Yoshida T, Nikaido T. The potential of amniotic membrane/amnion-derived cells for regeneration of various tissues. J Pharmacol Sci. 2007;105(3):215-228. Lee SB, Li DQ, Tan DT, Meller DC, Tseng SC. Suppression of TGF-beta signaling in both normal conjunctival fibroblasts and pterygial body fibroblasts by amniotic membrane. Curr Eye Res. 2000;20(4):325-334. Choi TH, Tseng SC. In vivo and in vitro demonstration of epithelial cell-induced myofibroblast differentiation of keratocytes and an inhibitory effect by amniotic membrane. Cornea. 2001;20(2):197-204. Hao Y, Ma DH, Hwang DG, Kim WS, Zhang F. Identification of antiangiogenic and antiinflammatory proteins in human amniotic membrane. Cornea. 2000;19(3):348-352. Fan MS, Jiang ZY, Zou YF, Qu L, Zhou X, Sun LZ. [Effect of transforming growth factor beta1 on the expression of matrix metalloproteinase 9, tissue inhibitor of metalloproteinase 1 and nuclear factor kappa B signalling pathway in the human amniotic cells WISH]. Zhonghua Fu Chan Ke Za Zhi. 2013;48(1):29-33. Kubo K, Ohnishi S, Hosono H, et al. Human amnion-derived mesenchymal stem cell transplantation ameliorates liver fibrosis in rats. Transplant Direct. 2015;1(4):e16. Gholipourmalekabadi M, Sameni M, Radenkovic D, Mozafari M, Mossahebi-Mohammadi M, Seifalian A. Decellularized human amniotic membrane: how viable is it as a delivery system for human adipose tissue-derived stromal cells? Cell Prolif. 2016;49(1):115-121. Roy R, Haase T, Ma N, et al. Decellularized amniotic membrane attenuates postinfarct left ventricular remodeling. J Surg Res. 2016;200(2):409-419. Liu F, Zhu ZJ, Li P, He YL. Creation of a female rabbit model for intrauterine adhesions using mechanical and infectious injury. J Surg Res. 2013;183(1):296-303. Li J, Du S, Sheng X, et al. MicroRNA-29b Inhibits endometrial fibrosis by regulating the Sp1-TGF-beta1/Smad-CTGF axis in a rat model. Reprod Sci. 2016;23(3):386-394. Hu J, Zeng B, Jiang X, et al. The expression of marker for endometrial stem cell and fibrosis was increased in intrauterine adhesions. Int J Clin Exp Pathol. 2015;8(2):1525-1534. Amer MI, Abd-El-Maeboud KH, Abdelfatah I, Salama FA, Abdallah AS. Human amnion as a temporary biologic barrier after hysteroscopic lysis of severe intrauterine adhesions: pilot study. J Minim Invasive Gynecol. 2010;17(5):605-611. Wang X, Duan H. [Clinical evaluation of amniotic products after transcervical resection of intensive degree of intrauterine adhesions]. Zhonghua Fu Chan Ke Za Zhi. 2016;51(1):27-30. 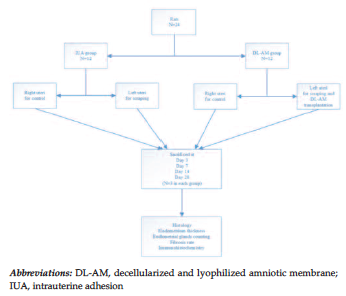 Gan L, Duan H, Sun FQ, Xu Q, Tang YQ, Wang S. Efficacy of freeze-dried amnion graft following hysteroscopic adhesiolysis of severe intrauterine adhesions. Int J Gynaecol Obstet. 2017;137(2):116-122. Riau AK, Beuerman RW, Lim LS, Mehta JS. Preservation, sterilization and de-epithelialization of human amniotic membrane for use in ocular surface reconstruction. Biomaterials. 2010;31(2):216-225. Gholipourmalekabadi M, Bandehpour M, Mozafari M, et al. Decellularized human amniotic membrane: more is needed for an efficient dressing for protection of burns against antibiotic-resistant bacteria isolated from burn patients. Burns. 2015;41(7):1488-1497. Kakabadze Z, Mardaleishvili K, Loladze G, et al. Clinical application of decellularized and lyophilized human amnion/chorion membrane grafts for closing post-laryngectomy pharyngocutaneous fistulas. J Surg Oncol. 2016;113(5):538-543. Francisco JC, Correa Cunha R, Cardoso MA, et al. Decellularized amniotic membrane scaffold as a pericardial substitute: an in vivo study. Transplant Proc. 2016;48(8):2845-2849. Salma U, Xue M, Ali Sheikh MS, et al. Role of transforming growth factor-beta1 and Smads signaling pathway in intrauterine adhesion. Mediators Inflamm. 2016;2016:4158287. Xue X, Chen Q, Zhao G, Zhao JY, Duan Z, Zheng PS. The overexpression of TGF-beta and CCN2 in intrauterine adhesions involves the NF-kappaB signaling pathway. PLoS One. 2015;10(12):e0146159. Alameddine HS, Morgan JE. Matrix metalloproteinases and tissue inhibitor of metalloproteinases in inflammation and fibrosis of skeletal muscles. J Neuromuscul Dis. 2016;3(4):455-473. Chauhan PS, Dash D, Singh R. Intranasal curcumin inhibits pulmonary fibrosis by modulating matrix metalloproteinase-9 (MMP-9) in ovalbumin-induced chronic asthma. Inflammation. 2017;40(1):248-258. Kerr LD, Miller DB, Matrisian LM. TGF-beta 1 inhibition of transin/stromelysin gene expression is mediated through a Fos binding sequence. Cell. 1990;61(2):267-278. Ke B, Fan C, Yang L, Fang X. Matrix metalloproteinases-7 and kidney fibrosis. Front Physiol. 2017;8:21. Acknowledgements: The authors are responsible for the content and for the writing of the paper. The authors have no conflicts of interest to disclose. This work was supported by the Natural Science Foundation of China (81270666).